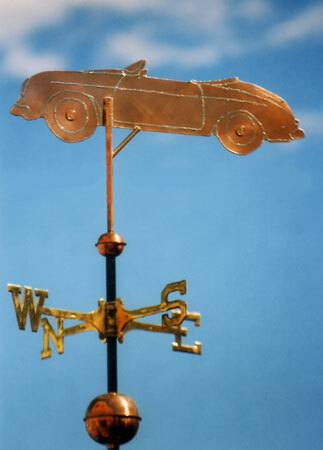 Our Porsche 356 Speedster Weather Vane is a classic basic silhouette style weathervane. It is made entirely of medium gage copper and we have used solder to delineate the door, windshield, convertible top, wheels, head and tailings and bumpers. The hubcaps are actually copper pennies, part of a ‘good luck’ tradition in weathervane making that dates back to the Victorian Age. The customer requested that we include pennies from years that were special to him and we soldered them in place with their dates displayed outwards for viewing. Viewed against the skyline, silhouette weathervanes are visually effective and sleek. 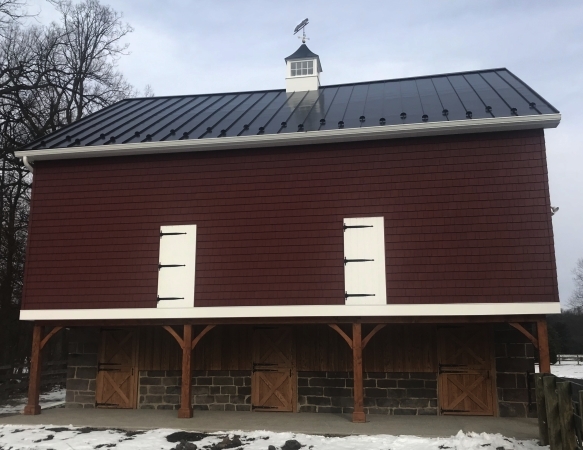 They are aerodynamic, fully functional, and require less time to fabricate than swell-bodied or fully 3-D weathervanes, which usually makes them less expensive than their multi-piece counterparts. We are often able to reduce the design fee for our more mechanical weathervane commissions if detailed schematic drawings are available. Also helpful are photos of the actual vehicle including detailed photos of insignia, detailing, interiors, etc. With this information we are often able to make truly personalized enhancements. If actual scaled down models are available, we often find them helpful guides during the construction process. Silhouette vanes range from basic, such as the one shown here to highly detailed. 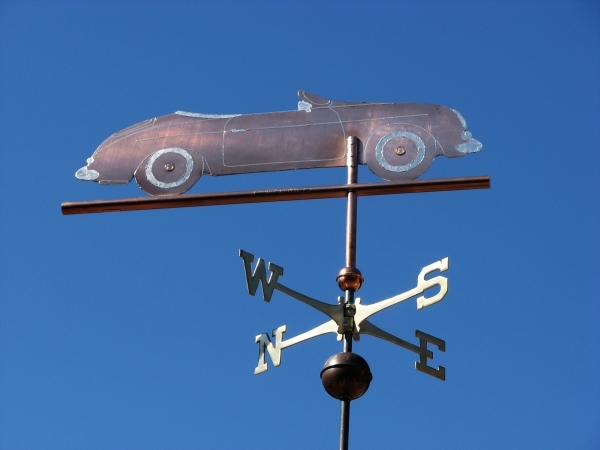 They can also include a horizontal tube below the wheels to represent the ground or we can add a half arrow tip and fletching (see our Porsche Carrera weathervane for an example), to indicate wind direction. Since each weathervane is built to individual order, we are happy to personalize your weathervane to your specifications. The Porsche 356 was a lightweight and nimble-handling rear-engine rear-wheel-drive 2-door sports car available in hardtop coupe and open configurations. Design innovations continued during the years of manufacture, contributing to its motorsports success and popularity. Production started in 1948 at Gmünd, Austria, where approximately 50 cars were built. In 1950 the factory relocated to Germany, and general production of the 356 continued until April 1965. Of the 76,000 originally produced, approximately half survive.